Rev. 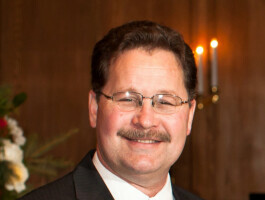 Gerald Newswanger (Pastor Gerry) was born and raised in Lancaster County, PA. In 1973 the Lord graciously called Gerry unto Himself and made him His child. In 1977, Gerry enrolled at Lancaster Bible College to study for the ministry. While there he met Susan Johnstone and they were married in 1981. After Gerry and Sue graduated from LBC they moved to Chicago in 1982 where Gerry began his studies for a Masters Degree in Divinity at Trinity Evangelical Divinity School. Upon graduation in 1987 he went to Feasterville Baptist Church where he served as Director of Christian Education and was Ordained to the Ministry. In 1991 Gerry accepted an invitation to become the Pastor of the First Baptist Church in Wycombe. Gerry and Sue have 4 children and enjoy ministering and living in Wycombe.